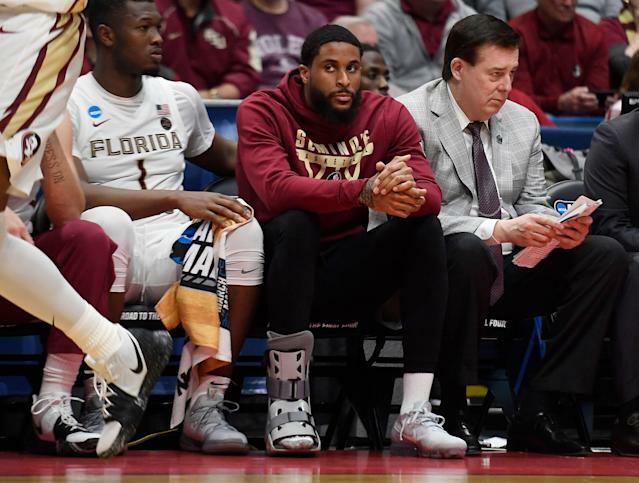 HARTFORD, Conn. — Minutes after Florida State's victory over Vermont to open the NCAA tournament on Thursday, senior forward Phil Cofer received a call in the locker room that his father had died. Mike Cofer was an All-Pro linebacker for the Detroit Lions who played collegiately at Tennessee. Mike Cofer suffered from amyloidosis, a rare disease that impacted his organs and tissue. Florida State associate head coach Stan Jones said that Mike Cofer was able to attend only one of his son's games during his five years at Florida State and missed both Senior Days the fifth-year senior participated in. "It was just painful to see your brother hurt like that," said Florida State senior Terance Mann. "Especially at a time like this. We all got together and cried with him and regrouped as a team." Cofer has endured a difficult year with the Seminoles. Jones said Cofer's mother has battled breast cancer the past few years. Cofer also broke his foot earlier in the season, which altered a trajectory that Jones said was headed toward Cofer becoming an All-ACC caliber player. "His growth was continuing as a player," Jones said. "I feel real bad. Part of the crushing emotion for him yesterday was, 'How much more do I have to take?'" Cofer did not attend No. 4 FSU's practice at the XL Center on Friday afternoon as they prepare to play No. 12 Murray State on Saturday. The news of Mike Cofer's death cast a pall over the arena, which had been buzzing the day before after the transcendent performance of Ja Morant. Cofer missed Thursday's game against Vermont, saying the broken fifth metatarsal in his right foot from October hasn't fully healed. A 6-foot-8 senior starter who averages 7.4 points and 3.5 rebounds, Cofer watched the game from the Florida State bench with his foot in a boot and said on Thursday that he'd be "day-to-day" for his availability. Florida State coach Leonard Hamilton said he "doubts" Cofer will play against Murray State, but he'll stay with the team through the game on Saturday. Not long after Cofer chatted about his foot injury on Thursday, he received news about his father's death. His teammates spent a lot of time with him on Thursday to offer support. "We're going to stick together and be strong for him," Mann said. "You know, whatever he needs, we got it. We really don't know what's next. We know we have a game tomorrow that we have to try and win for him." Jones said the team and staff met with counselors to talk about the death, as many of the players had not dealt with the death of the parent of a friend. Hamilton complimented Mike Cofer's competitiveness, which he passed down to Phil Cofer. "Yeah, it was very difficult for him and his teammates, and we spent a lot of time last night dealing with it in our own way," Hamilton said. "Our heart goes out to the Cofer family. They have been unbelievable Seminoles. We'll be there for Phil in every way possible." Florida State (28-7) is familiar playing without Cofer. He missed the season's first nine games with the foot injury, and it has impacted his ability to drive to the basket this season. Florida State has beaten LSU, Purdue and Florida without Cofer in the lineup this season. The tragedy on Thursday clearly transcends the game, and Hamilton said the team is preparing to support Cofer however possible. "It's challenging," Hamilton said. "It's never easy, but we're prepared to, and I think we've started doing everything we possibly could to let him know his basketball family is with him." Cofer had a message of his own Friday night to convey how much he appreciated the outpouring of support. He also had a message for his late father.